Under vice-chancellor Peter Rathjen, Adelaide University says it is aggressively targeting growth, mainly to be a more “global” institution. Adelaide projects its on-campus foreign student contingent to rise from 7877 last year to more than 10,000. Applications grew 28 per cent to 7702 and it has made 6352 offers, up 18 per cent. Deputy vice-chancellor Pascale Quester said developing “intercultural competence” in all students was vital. 1. 90% of students in my economics masters classes are international. 4. They tell me they choose economics because they can do the maths but don’t need to understand anything or write anything. 6. If half the class can’t understand English it brings down standards. It must—unless I fail half the class. 10. Unfortunately, this reality conflicts with the widely believed myth that our immigration program brings in “high skilled” workers. 12. Halving the number of international students would keep all the good students, boost standards for all, and remove the visa scams. 14. In sum, universities are being degraded so they can be used as a back-door immigration program, and no one at the senior levels of universities or major political parties want to change it. 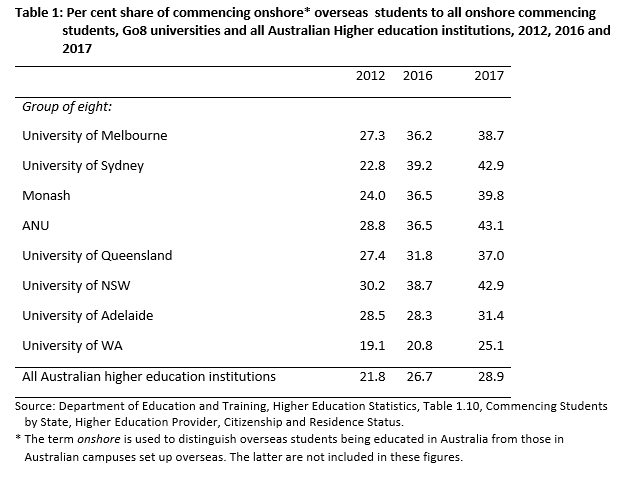 As I keep saying, Australia’s education system has become an integral part of the immigration industry and Australia’s population ponzi – effectively a way for foreigners to buy backdoor permanent residency to Australia. The Council for International Students in Australia said foreign potential students were attracted to Australia by the possibility of migrating here. Australia’s universities have also become a giant rent-seeking business, just like the superannuation industry. Rather than clipping the ticket on the deluge of funds coming in via compulsory superannuation, the universities sector instead clips the ticket on the deluge of foreign students arriving in the hope of transitioning to permanent residency. Instead of focusing on providing a high quality education and upskilling Australia’s population, the universities sector has become focussed on pushing through as many students as possible in order to maximise fees and profit. Again, this has parallels to the superannuation industry, whose focus is on maximising funds under management and fees, rather than achieving strong returns for members. The end result has been the erosion of standards and too many university graduates chasing too few professional jobs. About the only winners from Australia’s rent-seeking university system are vice-chancellors, whose pay has already exploded to an average of $1 million on the back of the student explosion, at the same time as university students are stuck paying off expensive and increasingly worthless degrees, taxpayers are stuck writing-off unpayable debts, and the broader population is suffering under the never-ending population crush. It’s time to put a leash on the university sector, starting with removing the link between foreign students studying at university and gaining work visas and permanent residency. Let our universities compete on quality and value alone.